Here at Nova Home Healthcare in Fairfax, we know the value of elderly folks being allowed to remain at home and we train our compassionate home healthcare aides to strive to not only become a helpful addition to the home but even a member of the family. When it appears to be time to make that choice for the next level of elderly care, it can be tough to find an ideal solution for yourself, your elderly loved one, and your family. At this critical time, it’s valuable to take everything into account to make sure that your plan is safe, positive, and sustainable in the long run. With an abundance of senior care options available here in Fairfax, how do we choose? There are many reasons that we believe in home healthcare and Nova is here to educate you on all of the benefits that this service has to offer. Contact us today to learn about our services, talk to one of our staff members, or to set up care for your aging loved one. An easier and better life for your family is just around the corner! 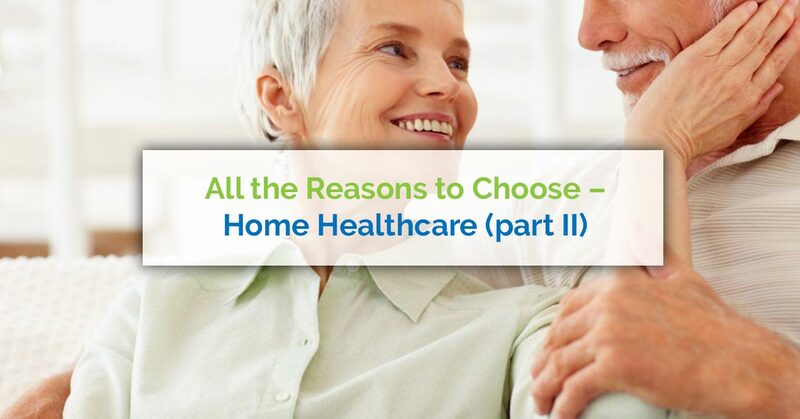 In part one of our blog series on the many benefits of home healthcare, we discussed how difficult it can be to take care of your aging parent or loved one on your own. The physical and mental strain can often weigh heavily on an individual who is simply trying to avoid sending their elderly loved one to a nursing home or extended care facility. We also discussed some of the reasons that home healthcare is a great option for your whole family. Your elderly loved one is more content and comfortable with the ability to remain at home, they enjoy some of the freedoms that they’ve always enjoyed, and receiving visits from friends and family are so much easier. In today’s blog post, we’ll continue learning about all of the ways that that home health care is beneficial for you and your elderly loved one. We’ll also discuss the many services that Nova Home Healthcare offers to the amazing community of Fairfax. Continue reading on to learn more about this life-changing option for families with elderly parents in need of care. As anyone who has worked with older seniors can tell you, major changes that occur in their lives can be extremely difficult for them to deal with. Significant life changes, including moving from home to a care facility, can bring out a number of physical, mental, and physiological issues. Traumatic changes of this nature can make memory problems worse, increase the physical manifestation of problems already present but lying dormant, or cause a whole host of other issues that could affect your loved one, your family, and yourself. What better reason to keep your loved one in the comfort and familiarity of home? All kinds of Fairfax people who reach out for a Nova Home Healthcare aide find that their aide is not only a skilled individual who is aware of the ins and outs of your situation, they find that their aide is kind, compassionate, and capable of increasing the joy of your elderly loved one. When you sign up to get a home healthcare aide, you’ll find that your aging parent or loved one will often look forward to seeing their healthcare aide who might eventually start to feel like a part of the family. Consider adding a qualified and compassionate person to come into the home and help take care of your elderly loved one today! There are so many reasons to contact Nova for home care, but did you know everything that Nova offers? We’re so much more than glorified “elder sitters.” We are staffed with professionals who are passionate about healthcare and have made a career out of compassionate home care. Let’s look at the many home healthcare services that we offer here at Nova. Whether you’re looking for a registered nurse, a licensed practical nurse, or a certified nursing assistant, Nova offers a variety of individuals with different levels of nursing skills that you can choose from based on your need. Our nurses are the best of the best and we can not only vouch for their experience and qualifications, we can vouch for their character and compassion. To get skilled nursing home care, contact us today! Do you know someone who could benefit from in-home speech therapy? Nova provides speech therapy for speech apraxia, aphasia, dysarthria, dysphagia, voice disorders, and so much more. Reach out to us now to talk about our in-home speech therapy services. Recovery from an accident, injury, or surgery doesn’t have to take your loved one out of the comfort of their own home. Nova provides amazing and qualified physical therapists that can help an individual regain muscle strength and function, improve range of motion, improve balance, and more. Contact Nova today for physical therapy at home. When you or a loved one is recovering from surgery, the ability to be home during that recovery can make a huge difference in how well and quickly one heals. Our home care aides can help with bathing and personal hygiene, meal preparation, housekeeping, and more. To schedule in-home care after a surgery, contact Nova today. In addition to the services listed above, we also provide registered dietitians, outpatient services, personal care aides, and occupational therapy. Nova understands that taking care of a loved one shouldn’t cause you to put everything else on the back burner; we want to step in and help you and your family enjoy a better quality of life. Are you curious about what a Fairfax home healthcare aide could do for you and your family? Contact us today to learn more about the healthcare option that’s becoming Virginia’s best answer for your aging loved one. Interested in a home care career? We’d love to talk to you about joining our team. Reach out to Nova Home Healthcare today!